GREENSBORO, N.C., USA, April 17, 2018 – Syngenta has received confirmation from the Environmental Protection Agency (EPA) that Fusilade® DX herbicide has been cleared for tank mixing with both XtendiMax® with VaporGrip® Technology and Engenia® herbicides. Fusilade DX will be available for use on Roundup Ready 2 Xtend® soybeans, providing growers with more options for a strong weed management plan this growing season. Volunteer corn, one of the most common weed escapes in soybeans, is efficiently controlled by Fusilade DX. Research conducted by Syngenta in Waterloo, Nebraska, found that when it comes to yield loss, volunteer corn is more competitive than giant ragweed, velvetleaf and pigweed. Fusilade DX offers post-emergence weed control for soybeans in all tillage situations. In addition to XtendiMax and Engenia, Fusilade DX readily tank mixes with a variety of other broadleaf herbicides. 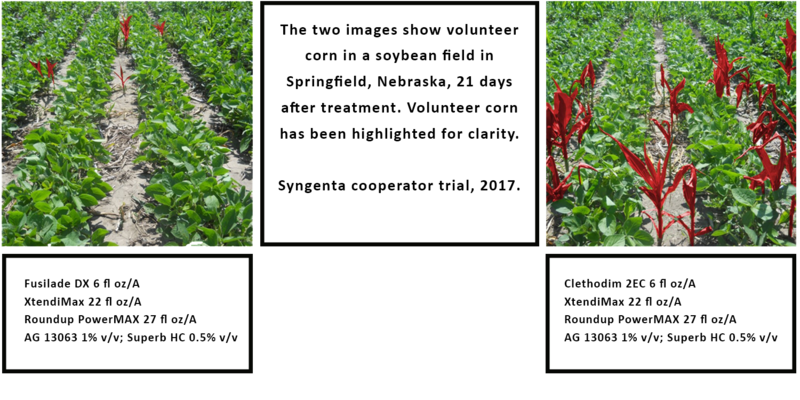 In a 2017 Syngenta cooperator trial, Fusilade DX tank mixed with XtendiMax had 87 percent control of volunteer corn 21 days after treatment, while Clethodim herbicide had only 70 percent control. Fusilade DX, along with all of the other recently cleared Syngenta herbicide tank mixes, has been tested according to EPA approved protocol and the results are certified in accordance to the terms and conditions of registration for XtendiMax and Engenia. *Check www.XtendiMaxApplicationRequirements.com and www.EngeniaTankMix.com for approved drift reduction agents. ©2018 Syngenta, 410 Swing Road, Greensboro, NC 27409. Important: Always read and follow label instructions. Some products may not be registered for sale or use in all states or counties. Please check with your local extension service to ensure registration status. The Genuity® Roundup Ready 2 Yield® and Roundup Ready 2 Xtend® traits may be protected under numerous United States patents. It is unlawful to save NK® Soybeans, Genuity® Roundup Ready 2 Yield® or Roundup Ready 2 Xtend® Soybeans for planting or transfer to others for use as a planting seed. Roundup Ready 2 Yield®, Roundup Ready 2 Xtend®, Genuity®, Genuity and Design and Genuity Icons are trademarks used under license from Monsanto Technology LLC. Fusilade® and the Syngenta logo are registered trademarks of a Syngenta Group Company. All other trademarks are the property of their respective owners.